Ensuring safety of the blood supply, the demand for plasma-derived therapeutics, and an aging population are factors driving growth in the global blood industry. The annual growth of plasma-derived therapies, used mostly to treat rare disorders, may exceed 10%. Hemophilia, hepatitis, cancer, and kidney failure are among the many conditions that are managed by blood transfusion or by therapy with plasma or plasma-derived products. An aging population suggests that there will be many more patients who need such products in the future. At a compound annual growth rate (CAGR) of 4.9%, BCC Research predicts the value of the global blood industry to increase from $33.5 billion in 2016 to $42.6 billion in 2021. The emergence of recombinant coagulation factors has allowed safer clotting factor products. The US FDA recently approved nonacog beta pegol (Rebinyn; Novo Nordisk) for treatment of hemophilia B, which affects an estimated 5,000 people in the United States. Factor IX is a naturally occurring clotting factor that is deficient in people with hemophilia B. The active substance in Rebinyn, nonacog beta pegol, is a recombinant coagulation factor IX. Rebinyn, given by infusion, is indicated for “on-demand treatment and control of bleeding episodes, and the perioperative management of bleeding in adults and children with hemophilia B,” the company said in a news release. BCC Research’s recent study, The Global Blood Industry, profiles major shifts in the blood and blood products industry. 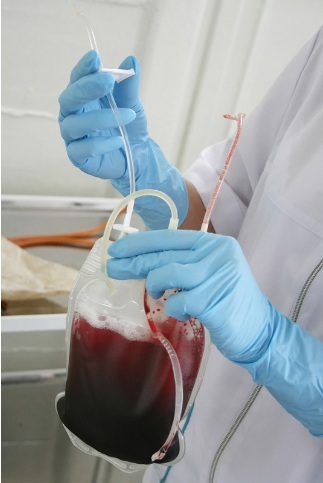 Safety of the blood supply is the primary concern, because major diseases can be transferred via blood transfusion. The American Red Cross remains the leading single organization supplying blood, with an estimated 40% market share. Globally, lower transfusion rates in both developed and developing countries are redefining medical care and the need for blood. According to the American Red Cross, blood transfusions have declined by 33% in the past five years. The revenue of blood banks is also diminishing. Changes in prescriptions for patients who undergo coronary bypass and other procedures have eliminated the need for millions of blood transfusions. In addition, minimally invasive procedures (e.g., laparoscopic surgeries) have led to a decline in the demand for transfusions. Furthermore, recent studies by the American Red Cross have found that most transfusions were unnecessary, which has increased the number of prescriptions for medicines instead. Moreover, hospitals have strengthened their blood-management programs. Initiatives include the collection of blood otherwise lost during surgery and returning this blood to the patient’s body, as well as the use of medicines to reduce blood loss during surgery. All of these factors have contributed to slow growth of the global blood industry. The global blood market includes products used for collecting, processing, and transfusing blood, as well as blood therapeutics. Sales of blood therapeutics were an estimated $25.8 billion in 2015. By 2021, these products are forecast to attain $35.1 billion in sales, reflecting a five-year CAGR of 5.2%. 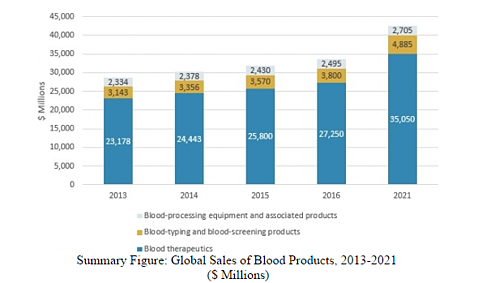 The global blood industry has had a significant drop in growth rate because of fewer transfusions and the development of minimally invasive technologies that have limited surgical bleeding and thus lowered the requirement for blood. Surgical sealant/fibrin glue is the largest-growing market segment, with an anticipated 15.8% CAGR over BCC Research’s forecast period (2016–2021). Some widely used surgical sealants have a collagen-based composition that lowers the risk of infection and is gentler to the skin. The United States accounted for $832 million in 2016 sales in this segment, in part due to an increasing volume of wound repair surgeries. The use of automated instruments is growing and is now the primary method for blood and plasma collection. The ability to collect two units of red blood cells from a single donor is speeding up the donation process. Blood typing and blood screening for disease have also benefited from automated instruments. The market for plasma fractionations has grown exceptionally well in the past decade and become a billion-dollar sector. The industry includes a significant number of high-capacity commercial players with extensive operations. The key drivers for this segment are demand for plasma fractionation services and the growing need for albumin. This segment is expected to grow at an anticipated CAGR of 5.7% over the forecast period.